Home is the context of an ambient-intelligence environment. Nonetheless, one can downsize the environment. For example, the human body as an environment, and by reading all possible bio-signals, this article can create control loops where many of these bio-signals can be used as sensory inputs to make humans aware of their current perceptual-cognitive state. In this article, the authors present an example where the peripheral temperature is used as a marker to know when a human switchover from a stress state to a calm state happens. The switchovers are controlled by the sympathetic and parasympathetic nervous system. The authors showed that finger temperature can be modulated by an effective auditory noise, and in four of the six tested subjects, 70 dBSPL was the optimal noise. These results open the possibility of making personalized, adaptive and anticipatory devices capable of modulating the switchover from a stress state to a calm state. Imagine a person returning home after a long journey and this person is exhausted. It opens the door and after many devices already installed in its house, have interacted with it that it is not even aware of them. From the surveillance cameras, automatic alarms and door locks. Once inside, automatically, the person can communicate with its family or friends and know about their whereabouts thanks to a GPS interface. Its smart kitchen is suggesting what to cook for dinner and ready to order a take-out if the menu does not please anyone. Meantime its health bracelet is saying that its stress level is high and immediately suggests it begins a biofeedback therapy or meditation exercises along with yoga. This history can continue forever like that, and it could represent our lives shortly, and it reflects how an electronic environment responds, or it is sensitive to human presence with the sole idea of helping people in their many activities and tasks. The way to implement this, it is not straightforward because it needs to be done as natural as possible. The technical field related to the relationship between this electronic ambiance and humans is known as ambient computing or intelligence. 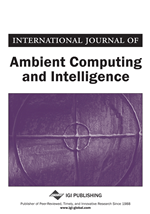 The ambient computing paradigm builds upon, among other things, human-centric computer interaction design that it is characterized by technologies and systems (Epstein, 1998). These systems and devices are embedded (many networked devices integrated within the environment). They could recognize a person and their current circumstances (situational context). They are personalized devices (tailor your needs). They are adaptive (change depending on your response) and finally they can have an anticipatory response (they know what you want before you are conscious of your need). Usually, as in our previous example, home is the typical context of an ambient intelligence environment, but it can also be enlarged to offices, public spaces, schools or hospitals. Nonetheless, one can downsize the environment as well. For instance, take a human body as the environment, and by reading all possible bio-signals, we can create control loops. That is, many of these bio-signals can be used as sensory inputs to make humans aware of their current physiological or cognitive state. Take back the health bracelet example, wherefrom heart rate, skin conductance, and peripheral temperature can be measured. The amplitude, slope, and variation of these signals represent dynamic transitions among different nervous systems whereby perception and cognition may be affected. A concrete example is a peripheral temperature; whose amplitude usually decreases when anxiety or stress is present. On the contrary when the peripheral temperature increases humans tend to relax. From the ambient intelligence point of view, we can ask how we can use this information to create a personalized, adaptive and anticipatory protocol and a device capable of modulating the transition from a stress state to a calm state. The peripheral temperature is controlled by the autonomic nervous system (ANS). The ANS is classified into sympathetic (SNS) and parasympathetic nervous system (PNS). They both primarily control the subconscious activity of the body. The SNS’s primary function is to excite the fight-or-flight reflex and the PNS is thought to trigger the rest-and-digest reflex.